The Goldsmiths Undergraduate Degree Shows boasted a plethora of emerging artists harnessing new media to assert changing and contemporary perspectives. A particular graduate of the joint honours BA Fine Art & History of Art programme, Michela De Nichilo, arrested the attention of exhibition goers with her impressive multi-platform exploration of the body. 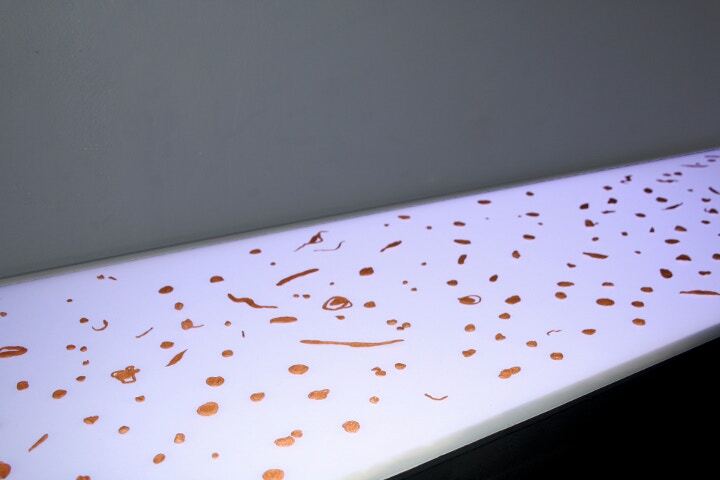 De Nichilo’s work investigates the interchange between the micro and the macro, utilising the elements of sound, video and sculpture in an installation which presents a unique experience of the qualitative over quantitative scientific knowledge of our internal systems. Over mirrored speakers the distinct sound of a churning stomach can be heard. Within the darkened room the glow from the parallel lightboxes illuminates intricately moulded terracotta sculptures which hover across the stark surface akin to cells inside the body. The boundary between organic and synthetic is challenged by De Nichilo, whose practice is an exploration of releasing the body’s sensation from established scientific fact; the singularity of an individual’s experience of their body over the certainty of observable phenomena. 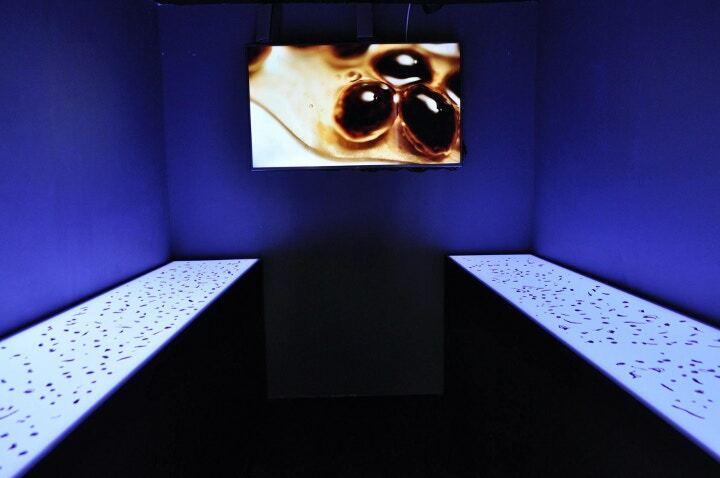 The video serves as a central focus within the installation, a provocative and visually stunning piece in which the artist has used rich foods such as honey, papaya seeds and olives in a visceral display which stirs desire both on a guttural and visual register. 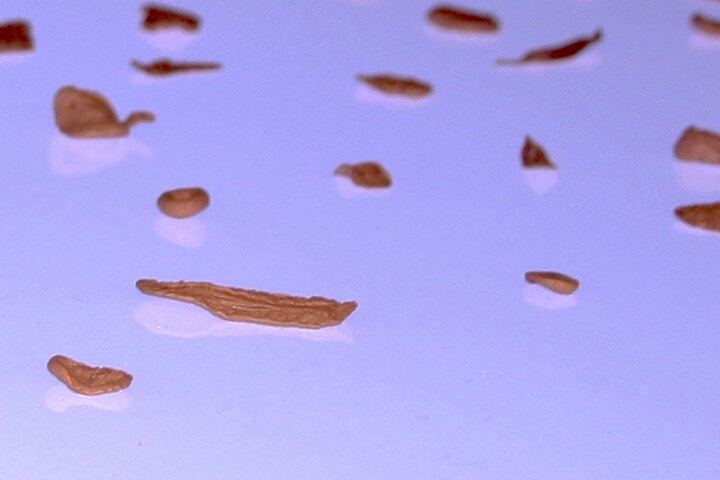 The seeds pass through the honey in a way akin to osmosis, the honey as a delicious, porous membrane, offering itself both as case study and indulgence. The stomach’s churning within the installation gives an intimate quality to the work, which places the viewer inside De Nichilo’s stomach, the noise with its own hypnotic rhythm which combined with the visually saturated video, lulls the viewer into a receptive state in registering their own body’s responses. De Nichilo has previously worked with the idea of the laboratory and the treadmill, the two light boxes serving as analogous to the clear, white space of the testing lab, whilst the horizontality calls to the mind the notion of a treadmill, of movement within a fixed space. De Nichilo is alerting the viewer to the fact of the constant change and movement taking place within the body at each moment, whilst the staticity of the terracotta sculptures allows viewers to imagine these changes on the cellular level in the artist’s physicalization and reimagining of that which can only be viewed through a microscopic lens. The work of Michela De Nichilo offers a contemporary perspective on the body in an age where we are probing deeper into an understanding of physical phenomena on a molecular level. De Nichilo’s work asks questions of how this molecular understanding of the human body shapes an individual’s conscious experience, and what it means to explore the subjective within inner space. De Nichilo is going on to study an MA at the Slade School of Art. Visit Xanthe Horner's website here and explore more of Michela De Nichilo's artwork and videos on her vimeo here.